Gluten Free Gals Living Glamorously AND Green! 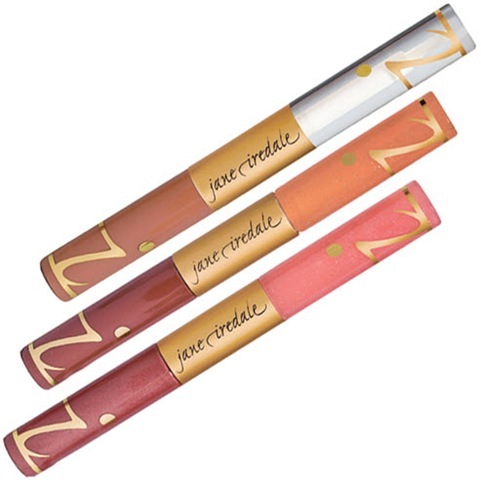 I’ve been a huge fan of Jane Iredale cosmetics for a while now. I even used their foundation and lipstick on my wedding day. Jane Iredale is the epitome of good-for-you cosmetic luxury. Dipped in beautiful gold-colored packaging and available in gorgeous shades, this line is based on minerals and all-natural ingredients. Most of the Jane Iredale products are gluten-free and they are all pretty much fabulous. I discovered Jane Iredale products a few years ago at a high-end salon & spa and have been hooked ever since. I’m a slave to their Liquid Minerals Foundation. It’s become one of my cosmetic-staple items. All I need is my foundation (and some mascara & gloss) and I’m ready for anything. I love browsing the Jane Iredale website for all the latest & greatest makeup treats. It seems like they are always adding new and exciting gluten-free makeup goodies to their line. So what’s new with Jane now? Two words, my fabulous friends: Lip Fixation. Lip Fixation is the brand-new lip stain & gloss duo that leaves your lips gorgeous for hours! I would know. I tried it. “Do double-beauty duty with two products in one. Each Lip Fixation boasts a lip stain and lip gloss in complimentary colors handpicked for the season. Choose between Desire, Fascination and Craving, or better yet, succumb to all three. I’m a big-time lipstick girl, and there’s nothing worse than having to constantly re-apply lipstick, so I was super-excited about this all-new lipstick stain. I like to talk and eat a lot (duh! hehe), so I’m always having to bust out my regular glosses and re-apply. And that’s annoying. I hate having to re-apply lipstick at a restaurant in front of friends, waiters, and staff. It’s such a bother to “freshen up” your shade when your out and about and it’s not professional to re-apply in front of your co-workers at work. So, having a lip stain that lasts through long hours in meetings, gluten-free munching, or much-needed socializing? Brilliant, Jane! I tried Lip Fixation in the Desire shade ($29) at my baby shower the other day. Desire is a gorgeous natural brown shade with a slight hint of pink. It’s a beautiful color that compliments my skin and makes my lips stand out without being obvious (like a bright red lipstick or coral shade). It went on smooth & matte and even smells slightly like Life Savers in the Butter Rum Flavor (random, I know, but that’s a good thing. Yummm….). I let it dry for one minute. Then I simply flipped it over and used the gloss (that had beautiful, very subtle sparkles!) for a pretty, complete lip-look. With all the eating, drinking, and baby/labor/birth-talk that went on for three hours at my baby shower, my lips still looked great! I definitely could have re-applied the gloss, but my lips were still stained! It was awesome and it was so nice to not worry about re-doing my lipstick in front of everyone at the shower, so I could just enjoy it, smile for the cameras, and have fun! Lip Fixation is like the Batman & Robin duo- the perfect team of stain and gloss to keep your lips looking colored & fantastic for the office, out with friends, or anytime you want pretty lip-color without the annoyance of it wiping away soon after using. It’s awesome stuff, worth the price, and may even become one of your cosmetic-staple items too! Subscribe to the Glamour & Green Gluten-Free Blog between June 8th, 2010- June 15th, 2010 and automatically be entered to win a FREE set of Jane Iredale Lip Fixation in all three colors (Desire, Fascination, & Craving… all three shades are gluten-free, of course and an $87 VALUE!!!). All Glamour & Green Gluten-Free blog subscribers’ names will go into raffle on June 16th and the winner will be announced that day! Subscribe & win FREE (FABULOUS) STUFF! Digital Scrapbooks and More is the ultimate one-stop-shop for instant, downloadable digital scrapbooking training, tutorials, digital supplies, and so much more! Offering the hands-down, the best step-by-step digital scrapbooking tutorials perfectly fit for Beginners, Intermediate, and Advanced Digital Scrapbookers. See our Tutorials in Our Scrap Shop! Specialize in digital scrapbooking training that you won’t find anywhere else! If you've never digital scrapbooked before, learn more about the Getting Started training, or go straight to our Scrap Shop to buy Getting Started Training for either Photoshop or Elements. And if you are already a digital scrapbooking pro, then there is Intermediate Tutorials and Advanced Tutorials! In addition, to digital scrapbooking see the new training in Photoshop and Photoshop Elements, and digital photography editing! For example take a look at the Digi MakeOver Madness series for virtual makeovers and photo editing training! Also see the digital scrapbooking kits and supplies so you can begin creating your own digital scrapbooking masterpieces TODAY! Take a look at the Quick Pages for getting started in Digital Scrapbooking Quickly! Check out the Holiday Scrapbooking Supplies too! If you like Custom Photoshop Brushes look at our special digital scrapbooking custom brushes in our Scrap Shop! Get FREE Digital Scrapbooking Goodies and News! Sign up for Digital Scrapbooks and More's FREE Newsletter, and receive FREE digital scrapbooking supplies, training guides, brand-new product information, or digital scrapbooking and photo editing articles every week! Not only that, but you will also receive exclusive Digital Scrapbooks and More subscriber-only sales!